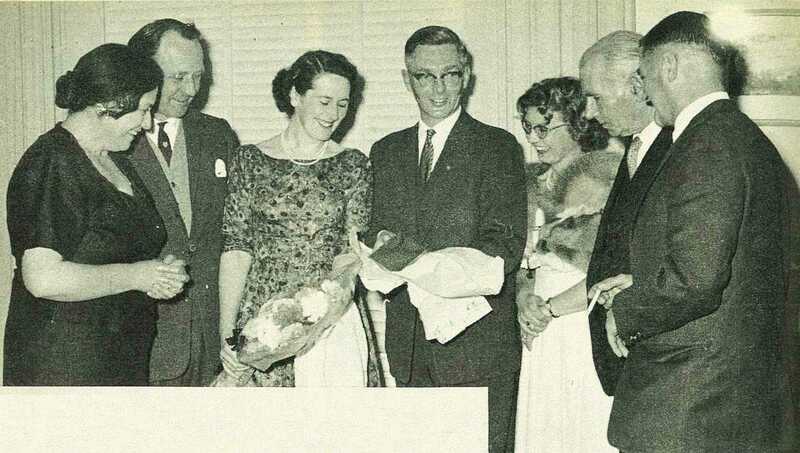 Admiring tokens of appreciation presented to the retiring Public Relations Officer, Mr David Clarke, and his wife, at a farewell function held at Ulverstone by members of Greater Gisborne Inc. are, from left: Mrs G. Wilkins (hostess). Mr H. M. Bodle (G.G. 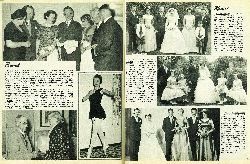 president), Mrs Clarke, Mr Clarke, Mrs A. Peake (playcentre representative), Mr P. W. Bushnell (G.G, life member), and Or Dr J. V. Gibson (function chairman). 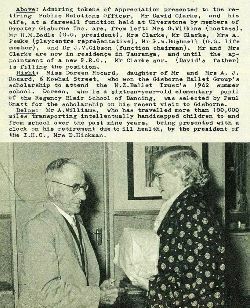 Mr and Mrs Clarke are now in residence in Tauranga, and until the appointment of a new P.R.O., Mr Clarke snr. (David's father) is filling the position. 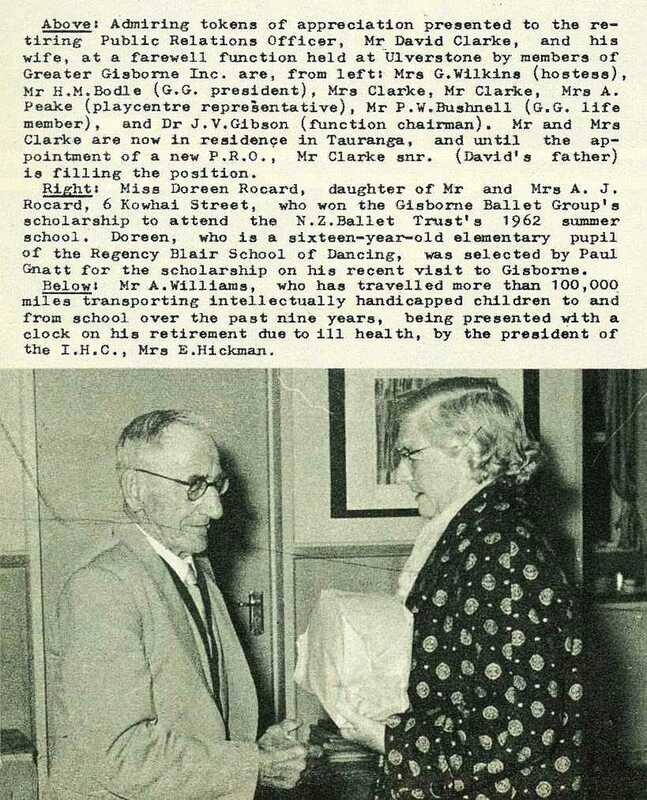 Mr A. Williams, who has travelled more than 100,000 miles transporting intellectually handicapped children to and from school over the past nine years, being presented with a clock on his retirement due to ill health, by the president of the I.H.C., Mrs E. Hickman. Miss Doreen Rocard, daughter of Mr and Mrs A. J. Rocard, 6 Kowhai Street, who won the Gisborne Ballet Group's scholarship to attend the N.Z.Ballet Trust's 1962 summer school. Doreen, who is a sixteen-year-old elementary pupil of the Regency Blair School of Dancing, was selected by Paul Gnatt for the scholarship on his recent visit to Gisborne.